The D-Link got it's first test on Halloween morning in 2015. While it wasn't really intended to capture the activity across the way, it did give some details to a break-in that happened to my neighbors cars. The unfortunate part was it obviously didn't see what happened to our vehicles, so of course that meant we had to buy another camera. 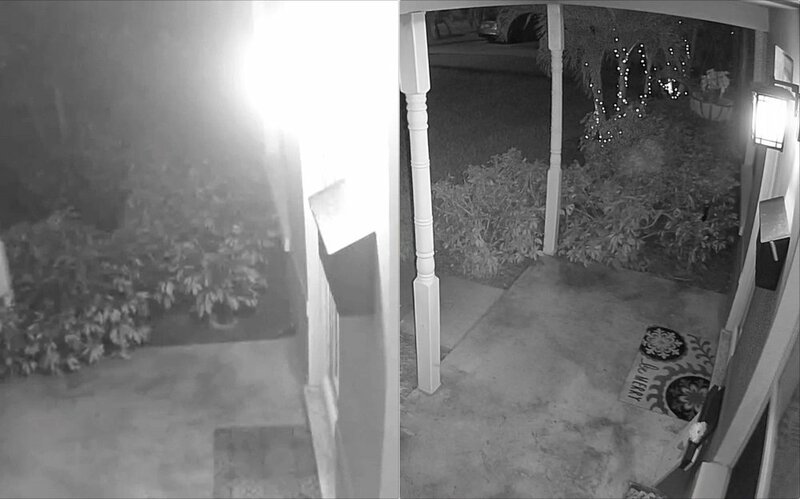 Something to note is the bright washout in the top right of the video from the porch light. Exterior lighting can be a bit of a challenge when it comes to camera positioning. The good news is there's a feature available in some cameras that can mitigate this. I knew I wanted a "dome" type camera for compactness and aesthetics, but the ones I really wanted (Axis) were out of reach price-wise . As I searched for an alternate camera I stumbled across Hikvision, and boy am I glad I did. They have a few different "dome" or "turret" style cameras in their line, but the ones that got my attention were the versions they market as EXIR (external IR). The main difference here is that instead of there being an LED infrared light (IR) ring, it utilizes a separate flood/projector style lamp offset from the camera optics. We took a chance and purchased a Hikvision DS-2CD2332-I turret camera to be located in front of the Garage door. We opted for the 2.8MM focal length as it should give us more viewable area. After spending some time with the EXIR style, I found there a few advantages of this over LED ring. For starters the separate IR flood eliminates "IR Bleed" or bounce back into the lens of the camera. While some like the Hikvision on the right isolate the camera lens from the IR lens, not all do and it can be a concern in some lighting situations. The other reason I really like this type of IR source is that it casts the light further and gives better coverage, ultimately lighting the scene better. Finally, I've found that bugs and lizards love either the IR light or the warmth it gives off, because the light is offset on the EXIR, this becomes less of an issue of the bug or lizard obscuring the camera. On our old D-Link we would get constant alerts at night of motion or just blocked camera for several hours while a gecko warmed itself on the light. Since moving to EXIR I've not had this happen again. Additionally the issue of the porch light washout is eliminated due to a feature called Wide Dynamic Range (WDR). This helps to compensate for bright light sources and artifacts and prevents them from over-saturating the image. After having installed the garage camera, we realized just what we were missing out on quality-wise. Not only was the Hikvision higher resolution, the sensor was clearly a better quality over the D-Link. So much so that we decided to get another Hikvision, this time the 4 megapixel Hikvision DS-2CD2342WD-I to replace the D-Link on the front porch. The text message you don't want. A little over a year passed and the morning after Christmas we got a text from one of our cars. I checked the camera and everything looked ok but Hester decided to go back and look at the clips while I went out to investigate. Sure enough, someone tried to pull on one of our doors which set off the alarm. We called the police and the camera footage was able to identify the suspect vehicle as well as get a count as to how many people were involved. While one officer was on my porch others were already chasing the suspects but had to break off (SPPD policy). At any rate we got some valuable data from that event and at least helped to confirm those individuals were responsible. I made a video, in the style of a "home movie" to show what was captured. This footage was captured mostly by a Mac OS DVR application called Sighthound, which I've been pretty happy with but the cost is a bit prohibitive for over 2 cameras, and it requires me to run it on an Mac OS system, which I'd rather not tie up. While I've been very happy with the performance of Hikvision, we were still on the search for the elusive, affordable, outdoor Pan-Tilt-Zoom (PTZ) camera. I've been looking at a vendor called Reolink for a few months. They have what seems to be the impossible, the Reolink RLC-423, an outdoor full 360 degree PTZ, optical zoom (4x), night vision, and Power over Ethernet (PoE) for under $250. Not a lot in the way of reviews, but for that price it was worth taking a risk. Black Friday rolled around and that price got knocked down to $199, I had to do it. The results are somewhat surprising. Seems to be well made, easy to setup, quick response to the PTZ commands, has ability to setup preset camera positions and do things like "patrol" an area to follow a preset path. The jury is still out on wether or not I'd recommend this, I'm currently having some issues with "tearing" and pixelation on images at times inside Blue Iris, Zoneminder, and VLC. The native Reolink app and the web interface do not share these problems so it seems it might be related to some compatibility or settings that need to be tweaked. I plan on spending some more time on it and providing a more thorough review once I get some things sorted out with Reolink support. There are a few options out there for DVR software. If you stick with a single camera vendor they will typically have some sort of software you can run which will do DVR functionality, but it will be a bit limited. If you mix and match, you're kind of on your own to find out what's best for your situation. There's the open source route, and really the only real option today is Zoneminder, which is pretty solid but lacks a bit of polish. Things like getting the Pan-tilt-zoom (PTZ) functions up and running can be a challenge, and not all vendors are supported easily. On OS X, the go to for me the past 2 years has been Sighthound. Which is pretty expensive, especially if you go above 2 cameras, however it's rock solid and has very good motion capture options ("human detection", "unknown object", and other rules). The push notification works really well with iOS devices and has a lot of polish. For me, the downside is that I'd like to expand the system, and the MacMini it's currently running on needs more disk space, more cpu, and really more everything. To continue down the Sighthound path I'd need to invest in another OS X system and that's just not in the cards. With OS X and Linux out, this brings me to the Windows world. There are a million+1 DVR products out there for Windows, but there's really one that stands above them all in the terms of flexibility and value and that's Blue Iris. I've avoided going to Windows for anything server based forever, but Blue Iris won me over (for those that know me, they know that's a hell of an accomplishment by Blue Iris). Setting up my cameras was as easy as putting the IP address into Blue Iris and letting it discover the features. PTZ worked flawlessly on my cruddy Foscam and my new Reolink RLC-423. A lot of good flexibility in the motion detection, the events, and the triggers without having to resort to scripting. Runs surprisingly well in a virtual environment and the available iOS app makes remote viewing hassle free. Blue Iris 4 discovering one of our cameras. In the coming weeks I plan to break down all these components into more detail. My hope is to document our setup for my own reasons and at the same time hopefully spare others the pain and suffering I've endured in building what we have. I'm not claiming it's all perfect or right, but just what's worked for me and the problems I'm trying to solve. If that sort of thing interests you please feel free to check back or subscribe for notifications.